This is our coverage of Barnsley, historically part of the West Riding of Yorkshire. Today's Metropolitan Borough of Barnsley was formed in 1974 with the amalgamation of the County Borough of Barnsley, Cudworth Urban District, Darfield Urban District, Darton Urban District, Dearne Urban District, Dodworth Urban District, Hoyland Nether Urban District, Penistone Urban District, Royston Urban District, Wombwell Urban District, Worsborough Urban District, Penistone Rural District, and some outlying parishes. At the same time it became part of the new South Yorkshire Metropolitan County. Since 1986 it has been a unitary authority. 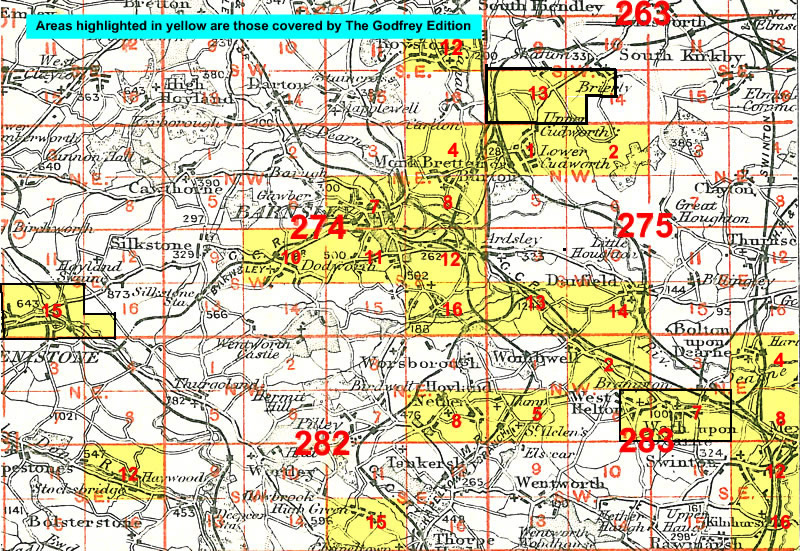 The following titles are taken from the OS 25" maps and reduced to a scale of approximately 14 inches to the mile. They are extremely detailed, showing individual houses, details such as railway tracks, pathways, pubs, factories and even minutiae such as fountains and signal posts. Each covers an area of a mile and a half by one mile, and includes an introduction. 87 Dearne Valley & Barnsley 1908-13 - published 2001; intro by Melvyn Jones. Includes a map of Grimethorpe.